Motorola Mobility (owned by Lenovo since 2014) is getting ready to release two new Android smartphones expected to be called Moto G4 and Moto G4 Plus. Thanks to several leaked photos, we can now confirm the fact that one of the new handsets is indeed called Moto G4 Plus. Two of the photos that we're talking about present the retail packaging of the upcoming device: on the front, we can clearly see the phone's name alongside the famous M(oto) logo, while the back of the packaging mentions some of its features, and shows the Lenovo logo. The Moto G4 Plus name also shows up on a screen protector that covers the smartphone in another leaked image. As previously rumored, the Moto G4 Plus features a fingerprint scanner below its display - a 5.5-inch one with 1080 x 1920 pixels. The handset has LTE connectivity, and is powered by an unknown octa-core processor, offering 2 GB of RAM (or 3 GB on some variants), and 32 GB of internal memory. There's a 5 MP camera on the front, while the rear camera is a 16 MP one with laser and phase detection auto focus. As for the battery inside the G4 Plus, this is a 3000 mAh one with TurboPower fast-charging. Near stock Android Marshmallow should be on board out of the box. Later today (or tomorrow, depending on your location), on May 17, Motorola will be hosting press events in Mexico and India to officially announce the Moto G4 and Moto G4 Plus. We'll update you with everything there is to know about the two handsets as soon as we have all the details. Who's excited about the incoming Moto G4 series? It is, by far, the ugliest smartphone I've seen in years. Nothing comes close to the of fugliness here, not even the G5 (LG). Moto G3/Turbo Edition was lovely though, can't understand how it became worse. Is that the Samsung Galaxy Nexus S2? Damn.. I can't believe this is the legend Moto! front fingerprint scanner ruins this design, sleek back tho.. 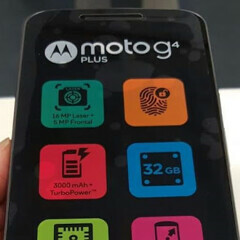 It will be Called Moto G 2016. Ya I don't get the hate here, first of all the bottom bezel is much thinner than the first leaks, so people need to see carefully that it isn't the same design but much better, second thing the company is offering replaceable back plates so the fingerprint sensor had to be in the front, third thing the sensor shape had to be square to differentiate as circle, rectangle and squircle have already been used by other companies and lastly I think the leak which PA posted yesterday was of Moto G4 (not the plus) which will come without the sensor so haters should calm down...My moto x (2013) has the same front mic which people suddenly hate and the back looks simple and elegant almost reminding of the Moto phones prior to droid phones.. Waiting for "moto x force 2 "
the back of the phone is giving me headache. The boot up animation says Lenovo then Moto. So this is Lenovo Moto G4 Plus, not Motorola Moto G4 Plus. They shouldn't have done that.